The New Deal’s executor held many positions similar to those of to one Donald J. Trump. Imagine a U.S. president who is bombastic, egotistical, and just a little racist. He worries opening the borders will mean an influx of undesirables. He implements capricious executive orders, and seems more concerned with his own power than with the Constitution. He’s often called a fascist by people who know what the term means. No, I’m not talking about Donald Trump. I’m talking about Franklin Delano Roosevelt. But that’s not quite true. FDR may not have been Hitler or Mussolini. But the difference was one of degree, not of kind. And now Trump is following in his footsteps. FDR spied on political dissidents in the name of national security. In May 1940, he warned of a “fifth column” in America (a military term for civilian rebels), and claimed refugees might be enemy agents. FDR was also hostile towards refugees. When Jews sought to escape from Nazi Germany, FDR barred the gates. In “FDR Goes to War,” noted historians Burton and Anita Folsom tell the story of how FDR used the Internal Revenue Service, Federal Bureau of Investigation, and attorney general to go after his political enemies. He wiretapped phones, ordered tax audits of dissidents, and created a personal spy group to collect incriminating information about political rivals. All of this was before FDR rounded up almost 122,000 Japanese-Americans and forced them into internment camps. While national security concerns were cited, FDR also considered Asians biologically untrustworthy. This isn’t to suggest that all opposition to immigration is fascist. Many reasonable Americans favor immigration restrictions. But FDR’s immigration ideas, summed up in his claim that immigrants ought to have “blood of the right sort,” were clearly prejudicial. So is Trump’s rhetoric about Mexicans. 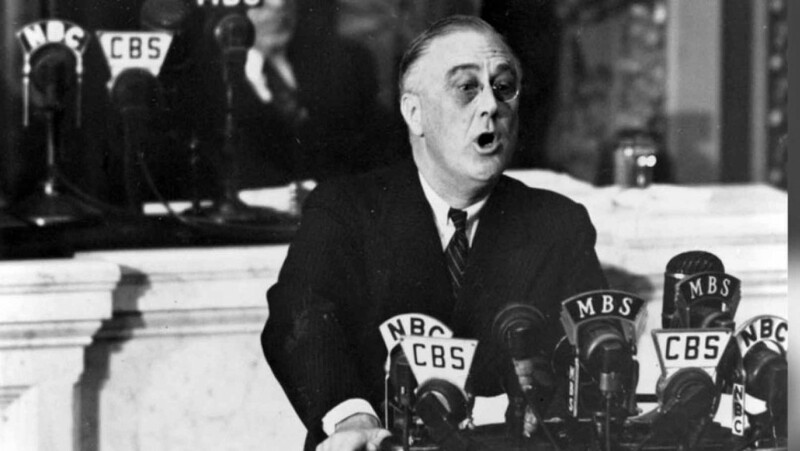 FDR saw himself as a benevolent dictator, and his actions reflect that grandiosity. Trump has made a campaign of this same sort of grandiosity. Like Trump, FDR had little respect for the separation of powers. When he tried to pass a 99.5 percent marginal tax rate on income above $100,000, Congress rebuffed him. So he issued an executive order mandating a 100 percent marginal tax rate, and lowered the ceiling to incomes of $25,000 per year (which Congress later rescinded). His attempt to do a similar end-run around the Supreme Court, the court-packing scheme, is infamous. Paul Warburg, one of FDR’s first-term advisors, claimed, “I believe that Mr. Roosevelt is so charmed with the fun of brandishing the band leader’s baton at the head of the parade, so pleased with the picture he sees of himself, that he is no longer capable of recognizing that the human power to lead is limited.” FDR saw himself as a benevolent dictator, and his actions reflect that grandiosity. Trump has made a campaign of this same sort of grandiosity. It’s true that FDR didn’t take total power in the United States, and that U.S. institutions prevented him from doing so. The Supreme Court struck down his ideas, especially before 1937. When he tried to pack the court with allies, the public rallied against him. Congress also refused to pass certain laws on his agenda. But FDR was both powerful and destructive. He was not Mussolini, but he ran roughshod over the rule of law, and dramatically transformed American politics—which should serve as an example of what a Trump presidency might look like. A Trump presidency could be even more dangerous, because the powers of the presidency have expanded. In fact, a Trump presidency could be even more dangerous, because the powers of the presidency have expanded. The White House can place citizens on terrorist watch lists—spying on them and preventing them from flying. The president can order U.S. citizens who are abroad, like Anwar Al-Awlaki, to be assassinated without a trial. The National Security Agency allows the president to spy on political dissidents such as Faisal Gill (a Muslim Republican) and Nihad Awab (director of a Muslim civil rights organization), or even to wiretap news outlets like the Associated Press. This doesn’t mean a Trump presidency would lead to brown shirts on the street. But there is more to fascism than goose-stepping and military style uniforms, and Trump, like FDR, displays many such characteristics. So when people look at Trump’s agenda and claim “it can’t happen here,” they’re ignoring history that’s not even a century old. Not only could such things happen, they already have. The only sure way to guard against Trump is to roll back the enormous power of the government that he would be managing. History, even in the United States, shows that dangerous men dupe voters and take power. We should shrink government so that when they’re elected, they take as little power as possible.